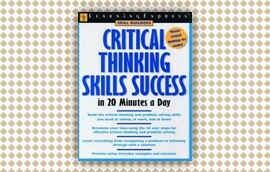 Critical Thinking Skills Success has a unique step-by-step approach to establish great critical thinking. It starts with a 35-question pre-test test to help diagnose strengths and weaknesses, and then proceeds to offer strategies for improving reasoning skills. With Critical Thinking, readers can master the techniques of effective persuasion and learn to solve problems logically. The book also features a post-test to help measure progress.